What would we do without the winning combo of potatoes and cheese to warm our bones and hearts? We just can’t think of many other single ingredients that when combined, lend themselves quite so well to the creation of our favorite comfort food dishes – then naturally we remembered BACON! 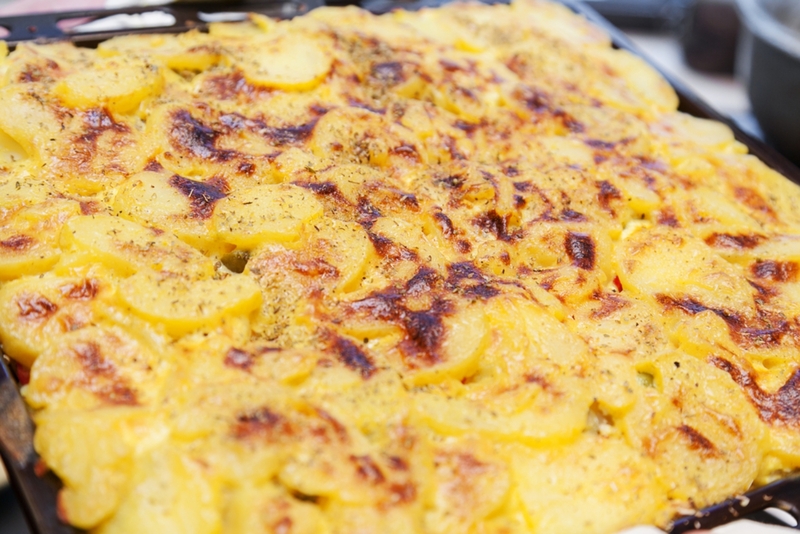 A long time favorite in our house, this meal comes from a classic potatoes au gratin recipe and is kicked up to ultimate perfection with the addition of bacon! Not just excellent for dinner, this is a great one to make for that special brunch or bring along to the next potluck. Believe us – you’ll be thanked profusely! Preheat the oven to 350º F and grease a 9x13 inch baking dish. In a large skillet, on medium-high heat, make a roux by melting butter and whisking in flour until fully combined. Mix in onions and garlic and cook until fragrant. Whisk in milk and cream until a gentle simmer is reached and whisk in cheddar cheese. Stir until cheese is fully melted and remove from heat. Place potatoes in a single layer in bottom of baking dish, then place 5-6 bacon strips over potato layer and pour about 1/3 of cheese mixture over the top. Continue layering potatoes, bacon and cheese until all are gone, making sure at least 1/3 of cheese mixture is reserved for pouring over the top. Cover with foil and bake until potatoes are soft, about 1 hour. Uncover and bake 10-20 minutes more, until the top is bubbling and browned.